Note:Here it is, the classic Bubnick/Russo masterpiece with the extra Runt tunes, B sides, Public Service spots, Wolfman Jack, the two tribute albums from the 80s, Cissy Strut from the Free Creek jam session, some extended versions. MUST-HAVE. RADIO ADVERTS: RA AD #1. RA AD #2. OOPS WRONG PLANET AD. NASSAU COLISEUM AD. GREEK THEATRE AD #1. GREEK THEATRE AD #2. WBCN INTERVIEW. Note:Infamous amoung fans. Compilation put together and edited by Paul Russo. MUST HAVE! Track List:SOLOS 1-5. JUST SIX VICTORIES. Note:This is a very cool creation where Shu just strung and edited these length pieces into independent pieces of beautiful tr gtr-right from the cds. Great sound-great idea-perfect splices..this has to be heard to be believed. What a great piece of collage/cut and paste art..for gtr nuts everywhere..the only boot pieces used are a couple of great Just One Victory solos from #6. wicked good fun! Track List:INTRODUCTION. OPEN MY EYES. LEMMING SONG. SHE'S GOING DOWN. CHRISTOPHER COLUMBUS. WOLFMAN JACK. SOMETHING/ANYTHING VOTER REGISTRATION AD. BEBE'S BEHIND. SOMETHING TO FALL BACK ON. HAMMER IN MY HEART. UMBRELLA MAN. LADY FACE. ANYWAY, ANYHOW, ANYWHERE. Note:Most of this is made up of alternate takes from Nazz, Todd, and Utopia releases and exTRa tracks that never made the official releases...GREAT STUFF! Track List:COMMUNION WITH THE SUN (DEMO). SOMEDAY WE'LL KNOW (with HALL & OATES). COULDN'T HAVE SAID IT BETTER MYSELF (MEATLOAF - TR BACKING VOX). WHILE MY GUITAR GENTLY WEEPS. WANT OF A NAIL (EDIT). PUBLIC SERVANT (EDIT). CAN'T STOP RUNNING (EDIT). CHANGE MYSELF (EDIT). HELLO IT'S ME (10/6/03 LETTERMAN). BLACK MARIA (w/ RINGO'S ALL STARR BAND). HEAVEN'S FALLING (CHEAP TRICK). MIDNIGHT CHORUS (ROGER POWELL). NO EASY STREET (PSYCHEDELIC FURS). PARALLEL LINES (NIGHT MUSIC '89). UTOPIA PROMO ADS. JUST ONE VICTORY (GUITAR SOLO w/ MEATLOAF '78). Note:Note: UK superfan The Surf Talks presents his first compilation and it's a great one. full of pieces as recent as fall '03, this runs the gamet from utopia to cheap trick. it's a lot of fun and a great way to "store" such excellent bits in one place. Track List:2004 Track List: SOUL BROTHER (UK SINGLE EDIT). AFTERLIFE (ORIGINAL VERSION). WONDERING (INCOMPLETE - NO VOCALS). WONDERING (INCOMPLETE - WITH VOCALS). A WALL IN NYC. THEOLOGY. CWSBF? - MANDY MOORE. LUCKY GUY - KIM WILDE. LOVE IS THE ANSWER - ENGLAND DAN AND JOHN FORD COLEY. MATED - J. GRAHAM AND O. GRANT. IWHMAD - PLANET PATROL. JUST ONE VICTORY - THE HELLO PEOPLE. I SAW THE LIGHT (TRUE STEREO VERSION). WOLFMAN JACK - WITH WOLFMAN JACK. TRAIN KEPT-A-ROLLIN' (ACETATE). JESSE. 12 DAYS OF XMAS. THE WAITING GAME (BAMMIES 1990). SOUL BROTHER (LETTERMAN 2004). I DON'T MIND AT ALL - BOURGEOIS-TAGG. Note:UK superfan The Surf Talks presents his second Todditties compilation and it's another great one (2004). Track List:MAN OF ACTION... B SIDE OF 45 "MATED". SOMETHING FALL TO BACK ON... EXTENDED DANCE MIX ISSUED 12' EP IN ENGLAND. HAMMER IN MY HEART... EXTENDED MIX ISSUED PROMO ONLY 12' EP IN US. UMBRELLA MAN... B SIDE OF UTOPIA SINGLE "SET ME FREE". WOLFMAN JACK... WITH WOLFMAN JACK ISSUED ONLY A SINGLE AND JAPANESE "SINGLES". SOMETHING/ANYTHING?.... JINGLE FROM TODD RUNDGREN RADIO SHOW IN 1972. FOUR IN ONE..... FROM "A TRIBUTE TO THELONIOUS MONK" LP WITH GARY WIND. CALL FROM THE GRAVE... FROM "LOST IN THE STARS" WITH GARY WIND (ALTO SAX). LOVE MY WAY... BY PHYCHEDELIC FURS US REMIX (PROD BY TOD). AEROPLANE... PHYCHEDELIC FURS, NOT AVAILABLE ON ANY ALBUM (PROD BY TODD). I'LL BE AROUND... BY WHAT IS THIS, EXTENDED VERSION(PROD BY TODD). LADY FACE... LIVE AT ROXY, LA MAY 1978 FM BROADCAST (WRITTEN BY MOOGY). ANYWAY, ANYHOW, ANYWHERE... LIVE AT SYRACUSE, NY NOV. 1979 FM BROADCAST. OPEN MY EYES... ACETATE VERSION. LEMMING SONG... DEMO TAKEN FROM ACETATE DISC. SHE'S GOING DOWN... DEMO FROM ACETATE. CHRISTOPHER COLUMBUS... TAKE 3 RECORDED IN ENGLAND, FROM TR RADIO SHOW. LOVE OF THE COMMON MAN...AT U.N. BUILDING, NY LATE 80S FOR JAPAN ‘24HOURS’ TV. LYSISTRATA... SAME AS LOTCM. Note:Just a nice collection of the non-released stuff afforded at TR TV (the Web) and then some...great work Istvan! Note:More on-line downloads/transfers by fan (Rick). Mostly repeats of Istvan's Compilation. One of (if not the first) the first appearances anywhere. One year before 1975 'AnotherLive'~! Utopia - The Metro Boston MA November 4 1982 (Boston Television/Radio Simulcast. Note:This is probably the best thing I’ve ever done. It is a mix and match 3 CD set of what we call ROIO (Recordings of Independent Origin). All are random selections of Fan audience audio recordings, or amateur audio recordings off Radio Broadcasts and/or Television/Radio Simulcasts. All ‘Done in Fun’ for serious Todd Rundgren Collectors and Enthusiasts. There’s some super rare and priceless stuff here. Never to be sold, nor should profit be made. 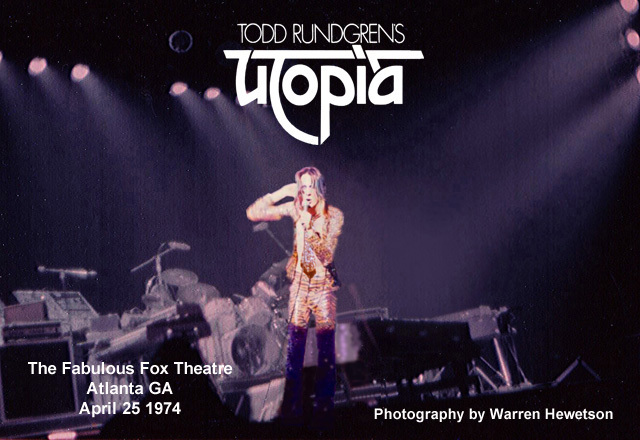 Our selections are culled from live performances by Todd Rundgren's Utopia (1973 - 1977), or Utopia (1978 - 1985) and intermixed with some Solo w/Friends performance. Represented here are years 1973 through 1989 of Todd’s career (The ‘70s’ and ‘80s’). And technically, none of these have been officially released (yet) or for sanctioned/approved sale on the retail market. I’m kind of proud of this 3 CD set that I’ve put together. Fahrenheit 451 is a non- profit ‘no names’ group of Collectors where a penny is not given, nor taken, for the love of what we do. And don’t we love to share this stuff?! I do not have any rights to, and again, I am not open for sharing any material that we may possess that has been commercially or officially released and is still available retail. I do not take or give any money for a single item either. I do not take away any proceeds that are due to Todd Rundgren, family, friends, business or supporting/associated musicians. If it is ROIO (recording of independent origin), then I'm open to share. Support the artist! Go buy their artistry where and whenever available! Speaking of which; an ultimate legit place to find/buy Todd's releases and imports & rarities is http://www.trbazaar.com/. Check it out! If Scott ain't got it it, nobody does...just about! And of course, many past & present official CD/DVD releases and proprietary Todd merchandise is readily available for ordering on-line at The Toddstore. So check them out for sure @https://www.facebook.com/thetoddstore . And just for what it’s worth, the WhooHooLive Folks are currently ‘in transition’. We’ll keep you posted on them. My first one; 'RUNDGRENS of INDEPENDENT ORIGIN 1973-1989' was probably the finest work I've ever done (http://forum.trconnection.com/viewthread.php?tid=11054#pid193377). So it would be hard to beat (probably can't). But here's another collection that I put together of live Todd ROIO… Recordings of Independent Origin…An old term, us audio collectors use, for not an Official product, but one that was recorded amature from Radio, Web Steam or recorded from the audience, or more importantly, from 'USB Sticks' the soundboard that you could buy after the show. Having said that, there are some tracks (7) here that are now officially released by Todd. However, mine are captures of my very own from live streaming on-line or 'USB Soundboard Sticks', way before the music became official. So these versions would still be 'virgin' before Todd and his organization remixed, edited & released. A perfect example is the 'Daryl's House' stuff. I stripped the audio off YouTube videos that Daryl was offering for free, years ago (long before the DVDs & his Website sundry). There's a few more like this. But I think you get my meaning. I put asterisks by all these seven situations. So basically nothing...Repeat NOTHING, has been taken directly from finished Official released CD or DVD product. I realize that I'm 'pushing the envelope' here, and I do not wish to get into a nuisance for these recordings I share. My caveat on my TRC Webpage (http://trconnection.com/todd/arcd-r) reads: "I do not have any rights to, and I am not open for sharing any material that may be listed below that has been commercially or officially released and is still available retail. (It may be listed below for collection listing purpose only). I do not take or give any money for a single item below either. I do not take away any proceeds that are due to Todd Rundgren, family, friends, business or supporting/associated musicians. If it is ROIO (recording of independent origin), then I'm open to share. Support the artist! Go buy his stuff where and whenever available!" Track List:DISC ONE : LOVE OF THE COMMON MAN- PARK WEST CHICAGO 8-23-78. COULDN'T I JUST TELL YOU- MIDNIGHT SPECIAL 74. A DREAM GOES ON FOREVER- MIDNIGHT SPECIAL 74. OOH BABY BABY- WMMR 6-30-71.DENNY AND JEAN- DRUNK SHOW RAFAEL 87. LOVE IS THE ANSWER- MIKE DOUGLAS 7-80.THE VERY LAST TIME -MIKE DOUGLAS 7-80. COULDN’T I JUST TELL YOU- MIKE DOUGLAS 7-80.LOOKING AT YOU BUT TALKING TO MYSELF- BOSTON 82. REAL MAN- MIDNIGHT SPECIAL 8-78. RANGE WAR- BOTTOM LINE 5-78.ONLY HUMAN- BOSTON 82.SAY YEAH- BOSTON 82.MAYBE I COULD CHANGE-HEADLINERS 83. FRIENDS - MOOGY AND TODD 78. DISC TWO: REAL MAN SPARK OF LIFE 8-6-83.MATED WARFIELD THEATER SAN FRANCISCO 3-10-90.NEVER MIND THE WHY & WHEREFOR TAJ AND TODD NIGHT MUSIC 10-29-89. PARELLEL LINES NIGHT MUSIC 10-29-89.CANT STOP RUNNING IN STUDIO TAKE 89-90.CANT STOP RUNNING NIGHT MUSIC 10-29-89.FOR WANT OF A NAIL PROMO VIDEO 89-90.FIDELITY PROMO STUDIO 89-90.WAITING GAME LETTERMAN 90.CHANGE MYSELF LETTERMAN 91. UNLOVED CHILDREN STUDIO PROMO 89-90.WORLDWIDE EPHONY LIVE IN CYBERIA 94. PROPERTY LIVE IN CYBERIA 94.HAMMER IN MY HEART TASTE OF CLEVELAND 9-1-96. LADYFACE 1-11.SONG OF THE VIKING BEACON THEATER 05. WORLDWIDE EPIP LIVE IN CYBERIA 94. DISC THREE: ONE WORLD VH1 NEW VISIONS ROCK 1990.CHICHE VH1 NEW VISIONS ROCK 1990.CHANGE MYSELF LETTERMAN 4-26-91.I HATE MY FRICKEN ISP 6-21-00.THE WALLS CAME DOWN.HELLO ITS ME LIARS LIVE 2005.WHILE MY GUTIAR WEEPS LIARS LIVE 2005. JAAN PECANS HO WINERY 3-7-12.ARE YOU HAVING ANY FUN KENT STATE 11-12-14.MUSCRAT LOVE BB KINGS 11-3-14.RUNNING BEAR KENT STATE 11-12-14.96 TEARS WINERY 3-7-12.TROLOLO 2014.GET LUCKY SPACE EVANSTON IL 4-2-14.FRIDAY AGORA CLEVELAND 10-10-12.NOT TONIGHT LATE NIGHT TV 2006.YOUR JUST WHAT I NEEDED REHERSALS 2006.LET THE GOOD TIMES ROLL 2006.DISC FOUR: COMPASSION UNDER RA PRYMID 10-20-12.I SAW THE LIGHT OPEN AIR STUDIOS 3-31-15.SONG OF THE VIKING OPEN AIR STUDIOS 3-31-15.BLACK AND WHITE SPIRT OF HARMONY CLINTON SCHOOL 3-16.HELLO ITS ME SPIRIT OF HARMONY CLITON SCHOOL 3-16.JUST ONE VICTORY CLINTON SCHOOL 3-16.IT WOULDN'T HAVE MADE ANY DIFF UI SCHOOL OF MUSIC 2010.A DREAM GOES ON FOREVER UI SCHOOL OF MUSIC 2010.BELOVED INFIDEL U. AUER HALL JACOBS SCHOOL OF MUSIC 12-19-10.PRETENDING TO CARE METROPOLE O. 11-11-12.FADE AWAY METROPOLE O. 11-11-12.12. GOD SAID METROPOLE O. 9-21-11.MATED AKRON 9-6-15.I SAW THE LIGHT.CAN WE STILL BE FRIENDS.IT WOULDNT HAVE MADE ANY DIFFERENCE.I JUST WANT TO PLAY THE DRUM TREETOPS BENIFIT RA PRYMID 10-20-12. THERE GOES MY INSPIRATION SALSBURY MASS 11-6-14. DISC FIVE : I SAW THE LIGHT RIDGEFIELD CT 10-9-12.LUCKY GUY RIDGEFIELD CT 10-9-12.CAN WE STILL BE FRIENDS RIDGEFIELD 10-9-12. EXPRESSO RIDGEFIELD CT 10-9-12. COURAGE RIDGEFIELD CT 10-9-12. IM SO PROUD RIDGEFIELD CT 10-9-12. FLAW RIDGEFIELD CT 10-9-12. DRIVE RIDGEFIELD CT 10-9-12. A DREAM GOES ON FOREVER RIDGEFIELD CT 10-9-12.I SAW THE LIGHT TEC AWARDS 2014.YOU GOT TO HIDE YOUR LOVE AWAY.HELLO ITS ME RIDGEFIELD CT 10-9-12. I SAW THE LIGHT WITH RINGO 7-15-12.LOVE IS THE ANSWER WITH RINGO 7-15-12.HELLO ITS ME TEC AWARDS 2014.HELLO ITS ME LOVE OF THE COMMON MAN OPEN EYS MELODY 2016. DISC SIX: HELLO ITS ME TODD AND CHAKA KHAN 1979.MAYBE I COULD CHANGE 1983.COME AS YOU ARE TUBES DEMO 1985. WHOS SORRY NOW SECOND WIND SESSIONS 1991. IF I DIDNT TRY AMASTERDAM 9-23-94.LYSISTRATA LOUDER LETTERMAN 1986.WHILE MY GUTIAR GENTLY WEEPS SONGS FROM MATERIAL WORLD 2-25-03.BLUEBIRD IS DEAD TRIBUTE JEFF LYNNE 2001.RUNDRENS REMIX...2015.DUMB AND DUMMER LOVE THYME 1994.FOUR IN ONE TODD AND GARY WINDO 1984.CALL FROM THE GRAVE TODD AND GARY WINDO 1984.THE WHEEL ROYAL OAK 1981.LYSISTRATA ROYAL OAK 1981. BLOW ME TODD AND RED PEATERS 2014.DISC SEVEN:REAL MAN 45 RPM MIX. COMPASSION ROYAL OAK 4-3-81.TIME HEALS LEVON HELM 7-3-81.LOVE IS THE ANSWER ROYAL OAK 4-3-81.LOVE OF THE COMMON MAN ... DONT YOU EVER LEARN....X GAME THYME 6-27-97.CISSY STRUT TODD AND JEFF BECK MUSIC FROM FREE CREEK SESSIONS 1973.SOMEDAY WELL KNOW TODD AND HALL AND OATS 2002.MY FUNNY VALINTINE PATRONET LATE 90S.RUNDRANS MIX ANYTHING VOCAL OUTTAKE 4-2-15.DISC EIGHT:BANG THE DRUM ROSETTA STONE REMIX.DONT TIE MY HANDS DEMOS LP 2001.HELLO ITS ME HYPNOTIC RECORDS.HELLO ITS ME PHLIP STEIR REMIX 2004.I SAW THE LIGHT ACAPPELLA LIVE 1985.SOMETHING TO FALL BACK ON RECONSTRUCTED .TECHNOPOPOLIS 2015.TINY DEMONS BBC 2 1982.YOU WERE THE ONE TODD AND PACK 3-11-14.DISC NINE: DOES ANYBODY LOVE YOU STRIPPED DOWN. IZZNT LOVE STRIPPED DOWN.IM SO PROUD STRIPPED DOWN.DUMB AND DUMMER 1994.MORE DUMB AND DUMMER.PATRONET MAYBE.NUMBER ONE COMMON D..TEENAGE WASTE LAND TODD AND IAN HUNTER 1980.WATCH YOUR BACK TODD AND DARYL 2009.DISC TEN: OVERTURE CORRECT SPEED 1977.SUNBURST CORRECT SPEED 1977 LITTLE DRUMMER BOY..1980.TEENAGE WASTELAND WITH IAN HUNTER 1980. TEENAGE WASTELAND WITH IAN HUNTER 2 1980.LADYFACE ROXY 1978.COME AS YOU ARE TUBES SCRATCH VOCALS 1985.CRYING IN THE SUNSHINE TODD AND MOOGY 1972.FRIENDS TODD AND MOOGY INCOMPLETE 1972.TINY DEMONS BBC 1982.MAYBE I COULD CHANGE 1982.CANT STOP RUNNING 1989 OR 1990.GOD AND ME 1981.JESSIE 1991.AFTERLIFE STRIPPED DOWN.FROGS PATRONET.SQUIDBILLIES THYME.DISC ELEVEN: THIS MUST BE LOVE KASIM SULTON. WHEN I PRAY 1978.HEALER SNL 2-21-81.TIME HEALS SNL 2-21-81.MIGHTY LOVE BAMMIES 3-15-86.JUST ONE VICTORY 3-3-89. REBEL REBEL FOX THEATER REDWOOD CITY CA 1-11-16.COULDNT I JUST TELL YOU LEMON TWIGS WITH TODD 4-13-17. BEGINING OF THE END ORLANDO 5-28-17.ENDLESS PRARIE FISH CENTER 2017.LETS DO THIS FISH CENTER 2017.RUNNING BEAR FISH CENTER 2017.CHANCE FOR UP TODD BOBBY STRICKLAND AND DARYL FROM VIDEO MIX 2017.LUCKY MAN TODD CARL PALMER ELP LEGACY 2017.GONNA BE 500 MILES .THE CHAPEL SAN FRANCISCO 8-30-17.BEGINING OF THE END COLUMBUS 5-6-17. Track List: DISC ONE:REBEL REBEL (LIVE) - PETER FRAMPTON.STARMAN – GARBAGE.THE JEAN GENIE - GRETA VAN FLEET.YOUNG AMERICANS - DURAND JONES - THE INDICATORS.MOONAGE DAYDREAM - KRISTEEN YOUNG.NEVER LET ME DOWN - BRITT DANIEL. LET'S DANCE - UMPHREYS MCGEE (FT. HUEY LEWIS AND JEFF COFFIN).SUFFRAGETTE CITY - THE STRUTS.AFTER ALL - MICHAEL PENN.FASHION - COREY TAYLOR.ALL THE YOUNG DUDES - LISA LOEB.OH! YOU PRETTY THINGS – DAWES.QUICKSAND - JADE BIRD.DISC TWO:MODERN LOVE - BIFFY CLYRO.I'M AFRAID OF AMERICANS – BONES.HEROES - SHAWN COLVIN.LIFE ON MARS - TODD RUNDGREN.GOLDEN YEARS - NIKKI LANE.JOHN, I'M ONLY DANCING - SUN KILL MOON (FT. PETRA HADEN).ZIGGY STARDUST – BLEACHERS.ASHES TO ASHES - CAR SEAT HEADREST.DIAMOND DOGS - LOW CUT CONNIE.FAME - DARYL HALL.ROCK 'N ROLL SUICIDE - GORGOL BORDELLO.SPACE ODDITY - WILLIAM PATRICK CORGAN. Track List:These are listed solely for my personal purposes (Archiving). I do not have any rights to, and I am not open for sharing any material that may be listed below that has been commercially or officially released and is still available retail. (It may be listed below for collection listing purpose only). I do not take or give any money for a single item below either. I do not take away any proceeds that are due to Todd Rundgren, family, friends, business or supporting/associated musicians. Track List: 1983-03-07 ROCKLINE (ROCK N' ROLL TONIGHT). 1984-03-12 ROCKLINE (OBLIVION). 1985-03-18 ROCKLINE (POV). 1989-06-12 ROCKLINE (NEARLY HUMAN). 1991-03-04 ROCKLINE (SECOND WIND). 2006-04-24 ROCKLINE (NEW CARS). 2013-04-17 ROCKLINE (STATE).